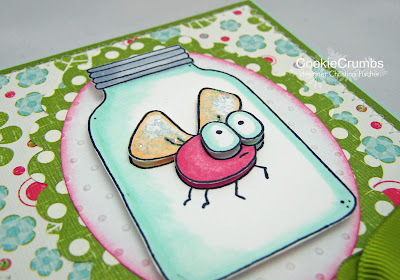 The jar and bug were stamped, colored and cut out separately and mounted on dimensionals. I did the same thing with another set of eyes, and I popped them up to add one more layer. Those eyes just make me giggle! I added some Stickles to the wings for a little sparkle, and I machine stitched around the dp. I sponged just the very edge of the embossed oval so it would pop against the dotted paper. That's all for today! Tomorrow I'll have my first MFTeaser for you -- I hope you'll stop back! Thanks so much for visiting! Hi there! Happy Saturday to you! 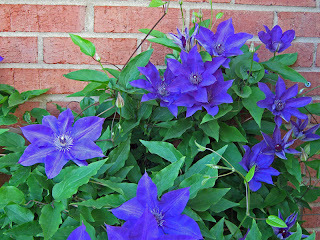 Also, I'm headed to Smithville, Ohio today with my friend Ann -- we're attending the Copic Certification class tomorrow! I'm so excited! What makes it even more fun is that the class is being held at Toyrifix, which is where you can find Tammy Hershberger most of the time! I'm SO looking forward to finally meeting her in person! I'll have one more All That Scraps preview for you tomorrow -- but feel free to stop by the ATS Blog or the ATS Design Team blogs to see what they've created! Thanks for visiting today! Hello! TGIF! 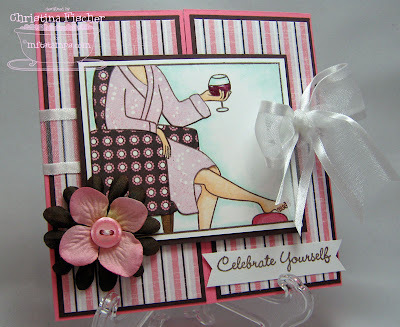 Today's preview is of Thank You Sentiments, a new set by AmyR Stamps. 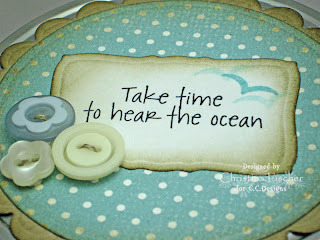 Amy has created some fantastic sentiment sets, and this one is one of my favorites! There are SO many sentiments for all your thank-you needs -- they can be used alone or with other images. 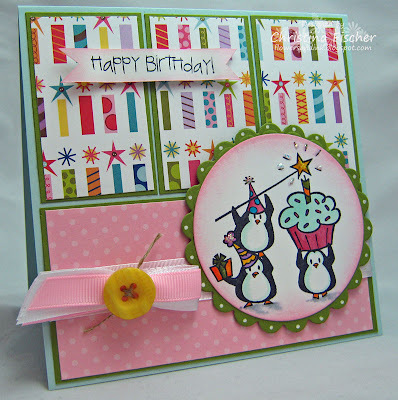 Here I decided to show how well they can be used as the focal point of your card! I scored a border at the bottom of the card, then I repeated the stamping under the score line. The flowers were cut from the dp using Cuttlebug flower dies -- it's a great way to make flowers which match your project perfectly! Stop by the ATS Blog to see more samples! This set and all the new sets will be released Monday, June 1 at 10:00 PM Eastern at All That Scraps! Happy Thursday! The All That Scraps previews continue today with a new Gingersnaps set, called Oh Baby!. It's probably no secret that I *love* these Gingersnaps images. I mean really, how cute is this?!? This card is 4.25" square. It's a pretty simple design -- I let the paper and image do all the work! I inked up only the word "baby" from one of the sentiments in the set, because it was just the size I needed. Quick Tip: Use only part of a sentiment if it suits your design better -- it's a great way to get more versatility from your sets! Hello! 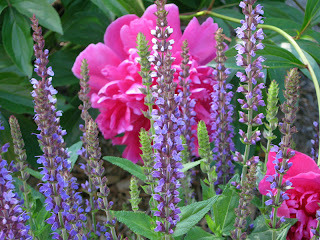 Happy Wednesday to you! Today begins a WEEK of previews and releases -- first from All That Scraps, then from My Favorite Things! Be sure to stop by the ATS Blog today and every day during the previews -- you can see more samples with the new sets, and you can find out how you could win a set of your own! I'll have another ATS preview tomorrow, so I hope you'll be back! Thanks so much for visiting today! The images are from Girls Night Out, and the sentiment is from Rain or Shine. I colored with Copics, then I added some glitter to the margarita rim and some bling fruit to the appletini! I also did some machine stitching around the dp. Hey there! Happy Thursday to you! Today's card was made with stamps by The Cat's Pajamas, which, sadly, were heretofore uninked. I've been a big fan of TCP stamps for quite a while and recently hopped off the fence to purchase a few sets. I was so glad I finally had a chance to play with them! Carole is the hostess of this week's TCP Challenge, which is a sketch challenge. Here's my take on it! I colored with Copics and added some Stickles to the star and party hats. I'm seriously addicted to button and ribbon treatments lately -- I used another one here. 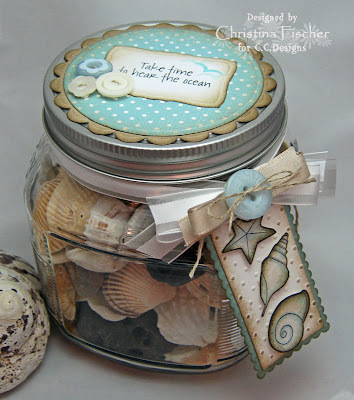 Susan has a great tutorial for using buttons HERE at SCS -- check it out when you get the chance! I am so excited about this mid-month release, because we'll change the way you gift! We're all looking for cost-effective gift ideas, and MFT has found PERFECT PACKAGING! What's in my jar? 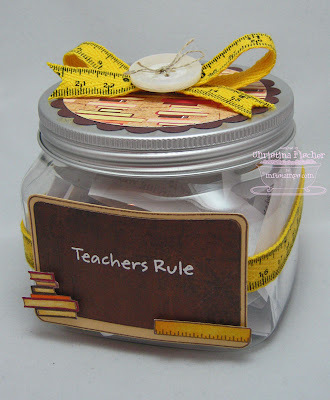 I created a teacher thank-you gift -- a jar of inspirational teacher quotes. 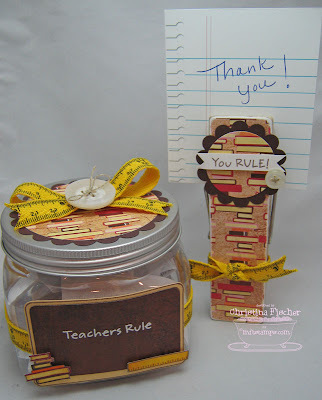 I am a teacher by profession, so I am fond of all things teacher-related. I just flipped when I saw the Teacher Label set and Stephanie's school papers, and I couldn't wait to use them together! 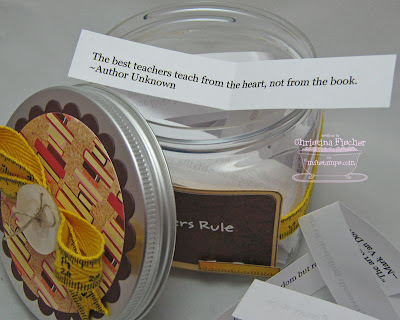 I went online and found some great teacher quotes (click HERE and HERE). I pasted them into a Word document, printed it, and sliced it up! Then I filled the jar! On the label, the sentiment was stamped in white craft ink onto BasicGrey dp and heat embossed with white detail EP. The books and ruler were colored with Copics, cut out, and popped up on dimensionals. As a last-minute idea, I made a coordinating jumbo clothespin memo clip. See the striped paper in the clip? It's another of Stephanie's patterns! :) Both buttons are from the Cup o' Buttons Spring Collection. Okay, you've seen what's in my jar, and now you get to see what's in Amy's! I'm sure it will be something fabulous! :) Thanks so much for hopping by! Hello! Happy Tuesday! My post for today will come later on tonight -- 10:00 pm Eastern, to be exact! 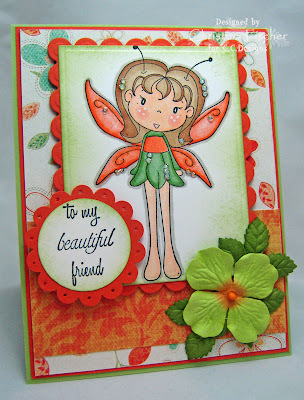 My Favorite Things is having a mid-month Hop Around the Block to kick off the release of some great new stamps and products! They will change the way you gift! Happy Monday, everyone! I hope you had a great weekend! I am playing catch-up today after being gone. It was great to see my brother and his family -- especially my new niece! I had a wonderful weekend, but I'm happy to be home! 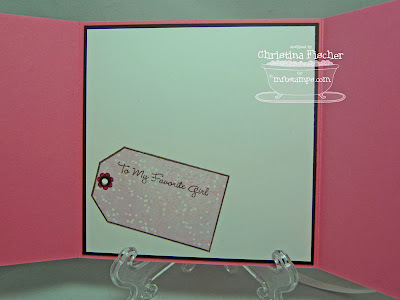 Here's my card for today's MFT Who's That Girl Challenge. The featured set this week is Here's the Scoop, and the challenge is to use eyelets. Play along with us -- use keyword MFTWTG35 when uploading to the SCS gallery. That's it for today -- I need to get Caroline off to school. It's her last week of preschool! Thanks so much for stopping by today! 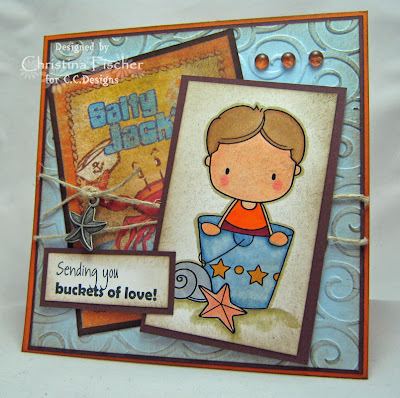 I just love this image of Trevor in the bucket, and it is so perfect with this sentiment from Beach Sentiments by AmyR Stamps. The panel behind Trevor is from On the Boardwalk dp by Flair Designs. I found a sheet in my stash and had to use it! I colored with Copics, then I "dirtied" everything up a little bit with Tim Holtz Walnut Stain Distress Ink, and I added a little starfish from my set of Beach Charms. Hi, everyone! Happy Thursday to you! 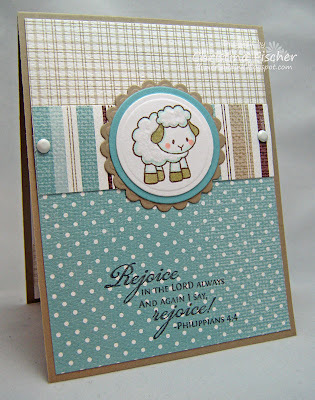 I'll be taking a few days off from stamping and blogging -- I'm headed to Charlotte, NC for my niece's baptism. I'll be back Sunday with a post featuring new C.C. Designs digi images! Happy Wednesday! Today's ATS Challenge is to use Stickles. I pulled out one of my favorite C.C. 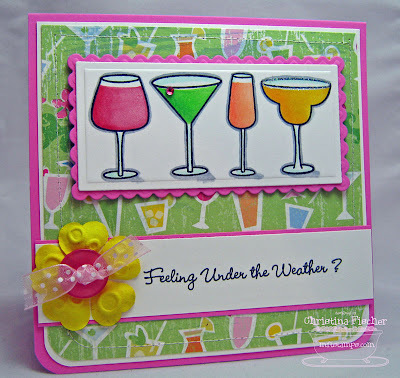 Designs images (from the set Summertime Fun) and some bright papers to make this summery card! And, of course, I used buttons again -- I can't seem to put them down! 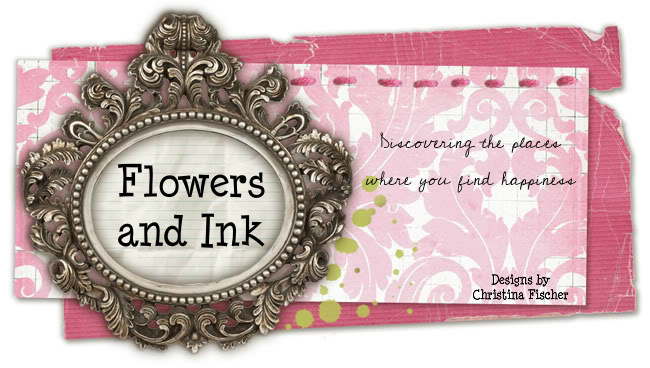 :) The layout is Jen del Muro's Sketch for You to Try. Also, be sure to stop by HERE and vote in the MFT Idol contest! We're down to the Final Four! Thank you so much for stopping by today -- have a fantastic day! Happy Tuesday! Here's a card featuring Getting There, one of the fun images by Emerson Quillin available at American Art Stamp. I colored with Copics and sponged around the image panel. I applied Moonlight Smooch to the chipboard flourish, and it really gave it a mother-of-pearl appearance. I added some adhesive pearls and SU! ribbon to finish the card. I did some machine stitching on the vertical paper panel, but most of it was covered up by the design! Happy Monday, everyone! 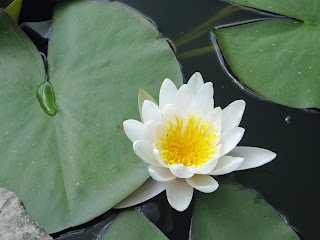 This is a quick post -- I'm going to the Aquarium with Anna's class this morning! Jessie is this week's guest hostess for the MFT Who's That Girl Challenge. 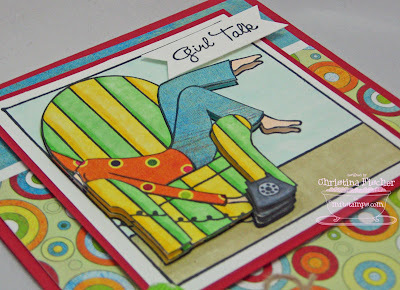 The featured set is Call Me, and the challenge is to use Paper Tole. Here's my card, made with BasicGrey Lime Rickey Paper (*love* it!). Thanks for visiting today! Have a fantastic day! Happy Sunday, everyone! 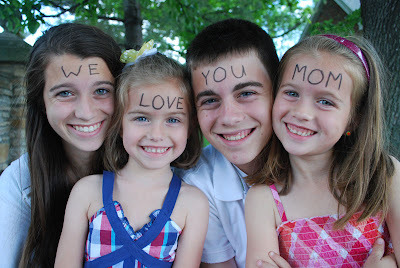 And to all of you mothers out there, Happy Mother's Day! Since I was mass-producing (6 cards total), I kept the layout the same for all cards. 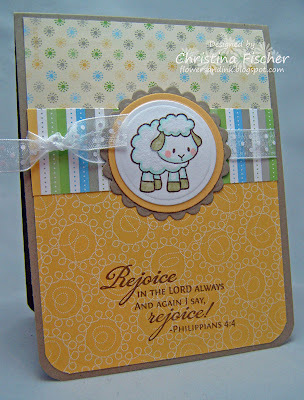 I just love this little lamb from Gingersnaps Spring Things by C.C. 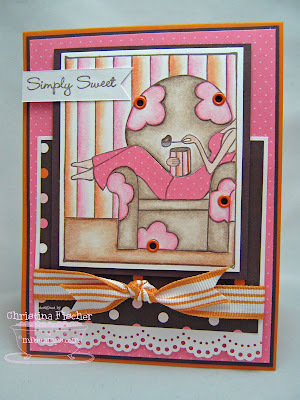 Designs -- it's just so sweet! I colored with Copics, and I used some white flock on the wool. For the boy card, I used SU! Parisian Breeze Specialty dsp. I gave the girl version some feminine touches with rounded corners and ribbon instead of brads. 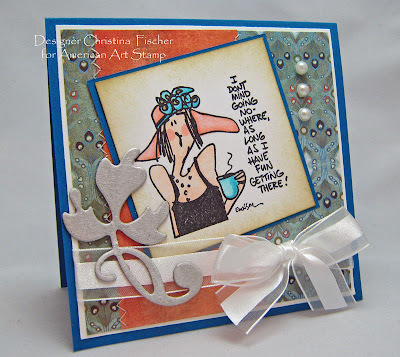 The verse is the Philippians 4:4 Plain Jane by Verve Stamps. On the girl card I used SU! Delicate Dots dsp. That's all for today! Tomorrow I'll be MIA -- I'm organizing a crafters garage sale at our church, with the proceeds benefiting our parish summer mission. The sale is tomorrow, and you should see my house right now! 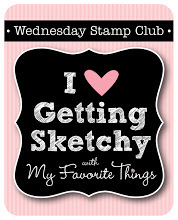 I'm up to my eyeballs in stamps, ribbon, scrapbooking supplies, and all kinds of other craft goodies! I'll be spending the today sorting and pricing -- EEK! Wish me luck! It's a Girls Day In! For my sample, I created a gatefold card with the set Girls Day In. I also used some of the other goodies being released this month: Chocolate Kiss Printed Paper Pack, Chocolate Kiss Ribbon Bundle, and Cup o' Buttons Pack. I paper pieced and colored with Copics. The card opens up to reveal a place to adhere a gift card or just write a personal message! I stamped the tag image onto the printed paper, cut it out and adhered it to the cardstock. Happy Tuesday! I have another MFTeaser for you! 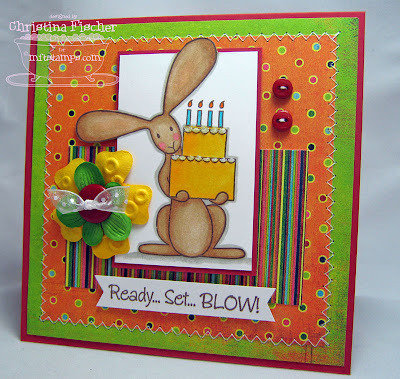 Flopsey's back in the set Birthday Flopsey, and it is SO cute! You probably already know that I *love* this bunny, so I'm having a lot of fun with this set! This is the card I created for my "Cutting out of the Box" How'd They Do That? tutorial last week. You can find it HERE on the MFT Member Company Forum. I colored with Copics, and I used my new Lime Rickey paper by BasicGrey. So much fun! I embellished with Prima flowers, Lime Rickey buttons, ribbon, and machine stitching. I also added some Stickles to the cake. Tomorrow, Wednesday, May 6, My Favorite Things is releasing four new sets, plus some yummy papers and embellishments! 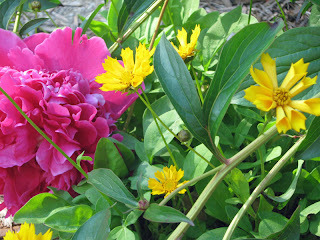 It all begins with a Blog Hop tonight at 10:00 pm Eastern, so I hope you'll come back to hop along with us! Then tomorrow night, join us for the Release Cocktail Party on the MFT Forum from 8-10 pm Eastern before the sets go live at 10:00! That's all for now, but I'll be back later tonight! I hope to see you then! Thanks for visiting! Happy Monday, everyone! I hope you had a great weekend! 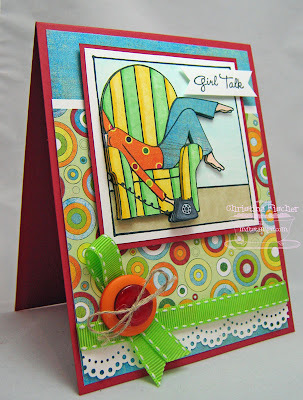 Today's Who's That Girl Challenge is a WILDCARD -- you choose and use YOUR favorite Who's That Girl set! The challenge part is to use the MFT colors black, pink, and white. I paper pieced her robe and colored the rest with Copics. I did some machine stitching around the pink paper. I'll have more MFTeasers for you tomorrow, so I hope you'll stop back! Thanks so much for visiting today! 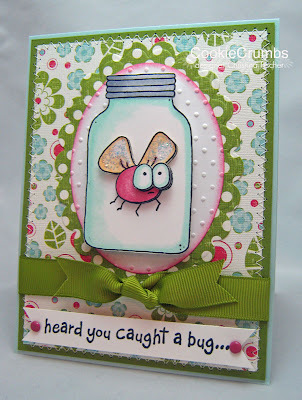 My second card has an image from Gingersnaps Bugg-A-Boos by C.C. Designs. 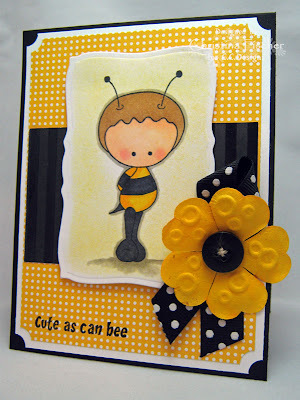 There are three images in the set: a butterfly, a ladybug, and this adorable bee! The sentiment is from the C.C. Designs set Bear Hugs. Another simple design, but fun nonetheless! The yellow paper is American Crafts, and the black is from Rockabilly by SU!. I colored with Copics and sponged around the image. Stop by the ATS Blog or the blogs of the ATS Design team for more samples of all the new sets! They will be released tomorrow (Monday) at 10 pm! That's all for now! Thanks so much for the visit! I totally channeled the spirit of my friend Lesa on this project -- her creations always have such a gorgeous vintage look with lots of dimension and texture. I used several Spellbinders Nestabilities, and I sponged all the edges with Tim Holtz Walnut Stain distress ink. 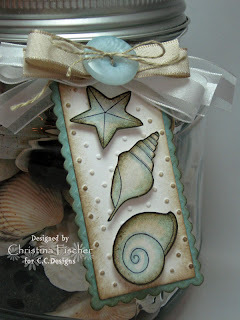 The shells on the tag were watercolored and sponged, then I cut them out and popped them up on dimensionals. Here's a closeup of the lid. Isn't this sentiment just perfect? You can see more samples of this set on the ATS Blog. I can't wait to see what the other girls came up with! If you stop by, you'll find out how you can win a set for yourself! All of the new sets will be released Monday, May 4 at 10 pm! I hope you are liking the previews so far -- I still have more to show you! Thanks so much for visiting today -- I really do appreciate it!